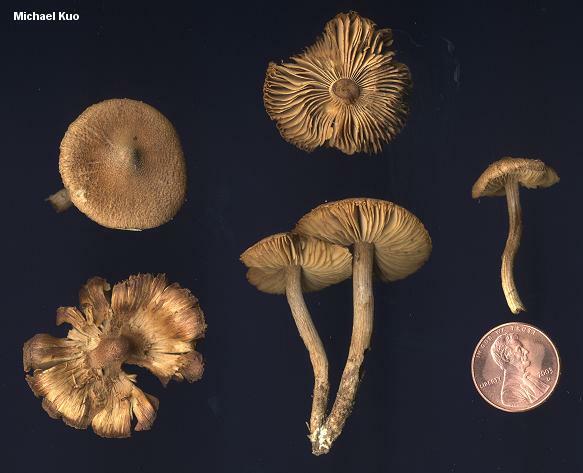 Among the many brownish little Inocybe species with lacerated caps, Inocybe lacera doesn't stand out in the crowd--until you examine its spores under the microscope. If you didn't know better, you would almost think you were looking at the stretched-out, nearly cylindrical spores of a bolete. Its prominent cystidia are also distinctive--and, oh yeah, did I mention that Inocybe lacera is a little brown mushroom with a splitting cap? 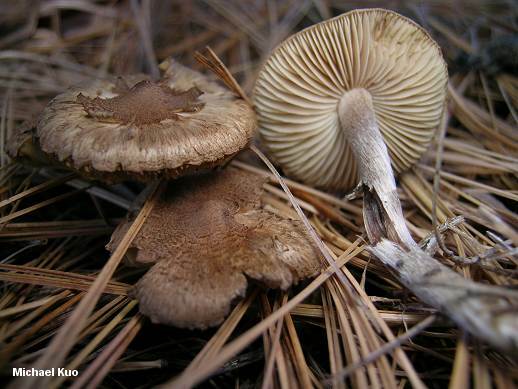 As though separating this mushroom from other species of Inocybe weren't enough of a challenge, those wacky mycologists have gone and described a host of varieties and forms of Inocybe lacera--including, in North America, var. 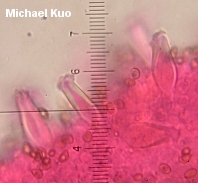 heterosperma (with a spermatic, rather than mild, odor, and extremely variable spores ranging 5.5-15.5 µ in length) and var. subsquarrosa (a "dwarf form" with small spores and thin-walled cystidia). There are other varieties which I should dutifully look up and report on, but a CSI re-run is just about to start; which activity would you choose? 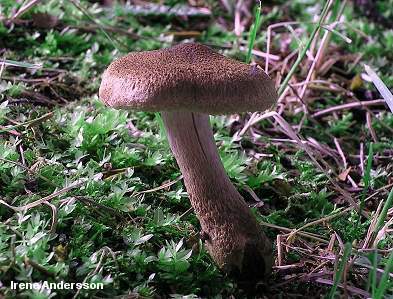 Ecology: Mycorrhizal with conifers or hardwoods; growing alone, scattered, or gregariously; summer and fall (also spring, at high elevations in Montana, where it grows under Quaking Aspen); widely distributed in North America. 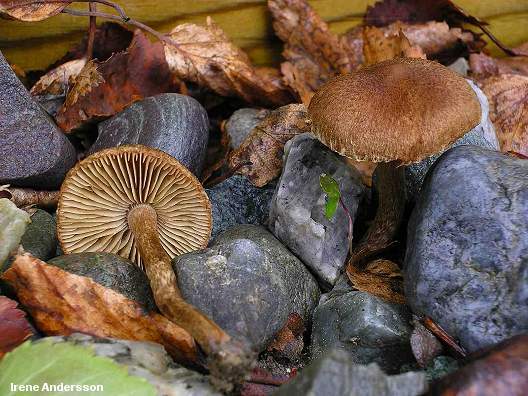 Cap: 1.5-4 cm; convex to conical, becoming broadly convex or broadly bell-shaped; dry; densely hairy or scaly, becoming cracked and lacerated; brown; sometimes with pale remnants of the cortina along the margin. 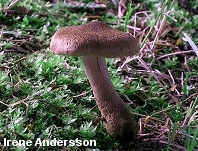 Gills: Attached to the stem; close or crowded; pale at first, becoming brownish with maturity (and then usually with whitish edges); at first sparsely covered by an ephemeral cortina. 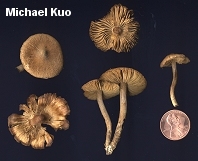 Stem: 1-4 cm long; up to .5 or nearly 1 cm thick; more or less equal; dry; finely hairy or nearly smooth; pale brownish; rarely with a thin ring zone resulting from the cortina. Chemical Reactions: KOH on cap gray. 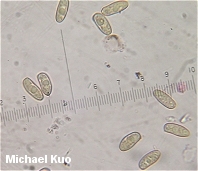 Microscopic Features: Spores 12-17 x 4.5-6 µ; long-elliptical or cylindrical; smooth. Pleurocystidia 50-70 x 10-20 µ; fusiform or fusoid-ventricose; walls 1-3 µ thick; often apically encrusted. Cheilocystidia similar to pleurocystidia. REFERENCES: (Fries, 1821) Kummer, 1871. (Saccardo, 1887; Kauffman, 1918; Kauffman, 1924; Grund & Stuntz, 1977; Stuntz, 1978; Smith, Smith & Weber, 1979; Grund & Stuntz, 1981; Phillips, 1991/2005; Lincoff, 1992; Hansen & Knudsen, 1992; Cripps, 1997; Phillips, 2005; McNeil, 2006; Miller & Miller, 2006.) Herb. Kuo 11050404.